It used to be that beans were considered a “poor man’s food” but, in most recent times the bean has been recognized as a very desired and nutritious meal. These seeded pods of the Leguminosae Family are among the oldest foods known to humanity, dating back at least 4,000 years. 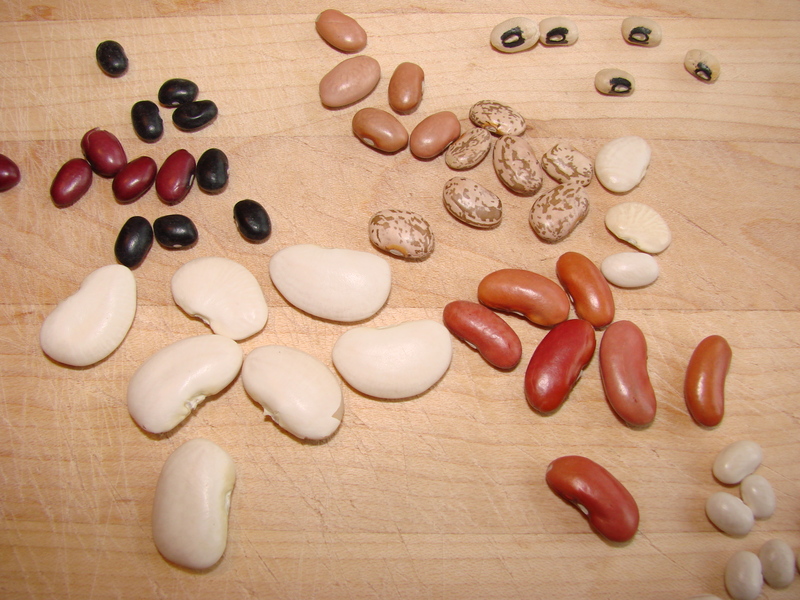 There are many varieties of beans and some are considered heirloom beans. Some of these “heirloom beans” I am certain could tell fantastic stories of history, countries and people…… I wonder how a curious name like the “Eye of Goat Bean” came about and the “White Speckled Brown Cow Bean?” These two beans were just recently discovered in a cave in Kenya, Africa, and believed that they originated in that country. Beans show their different characteristics not only by their looks, but surprisingly differ greatly in flavor and taste. Some are mild, while others have robust, hearty flavors. Many have a nutty taste or even taste sweet with creamy textures when cooked. Others remain firm when cooked and stay intact. Many varieties hold their spectacular colors when cooked while others discolor. Having discovered these wonderful differences in beans has enabled many an imaginative chef to develop exciting recipes that put the bean onto an elegant table in many of today’s best restaurants all over the world. Nutritionally the bean is full of vitamins. 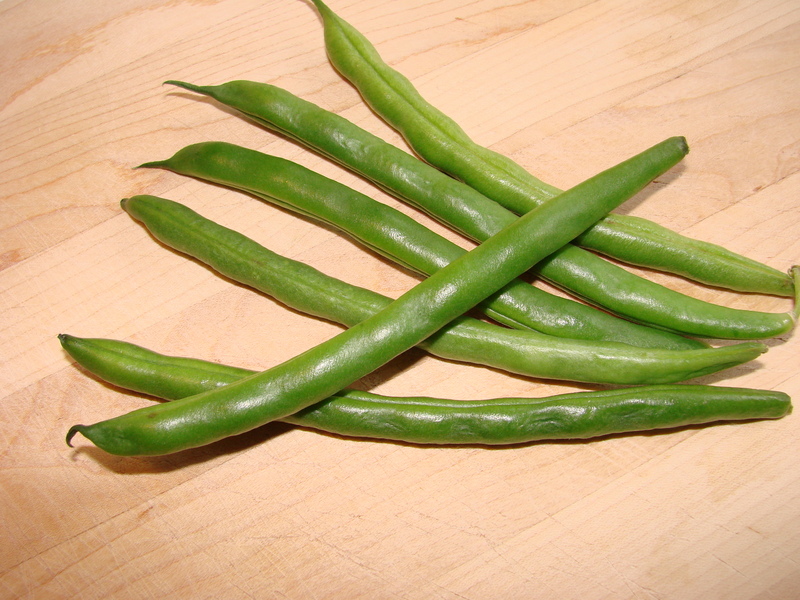 When fresh and eaten in the green state the bean contains Vitamin A and C. Dried beans are rich in protein, calcium, phosphorus and iron. In many countries where meats are scarce, the dried bean is the main source of protein. Here is a basic bean soup that can become any nationality you would want it to be every time you make it. Use any kind of bean……. 4-6 cups Chicken Stock – or less, depending how much soup you want. Pepper and Salt to balance the flavors………. Add all ingredients in a soup pot and boil the soup until the vegetables are just tender. but, this is optional as well. Serve with sour cream and green onions….or match it with condiments of whatever your soup’s Nationality will be! Hungarian……add Sweet and Hot Paprika to the onion after it is just caramelized and take it off the heat ….so that the Paprika does not burn……then add a smoked Hungarian Sausage cut into small pieces and let it boil up for just a minute or two…….serve with sour cream, cubed bell pepper and chopped parsley……..and some crusty bread. 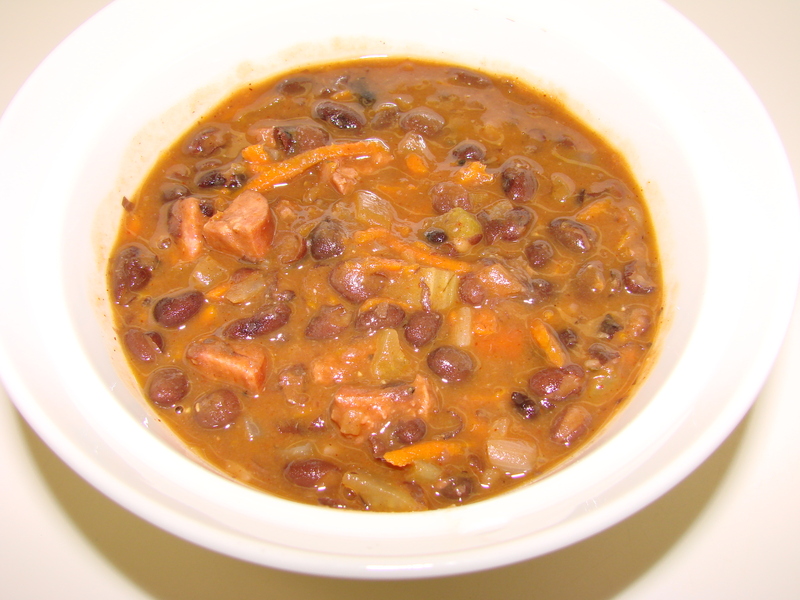 Curried Bean Soup……..add Curry powder or make your own and continue as in the Hungarian soup. Roast a leg of lamb and add roasted lamb instead of a sausage…..Serve Yogurt Sauce ……yogurt, chopped cucumbers and chopped mint or dill… You might like to serve this soup with rice. Polish Bean Soup……..add a smoked Polish sausage and salt and pepper….sour cream…..and chopped scallions…..and noodles. 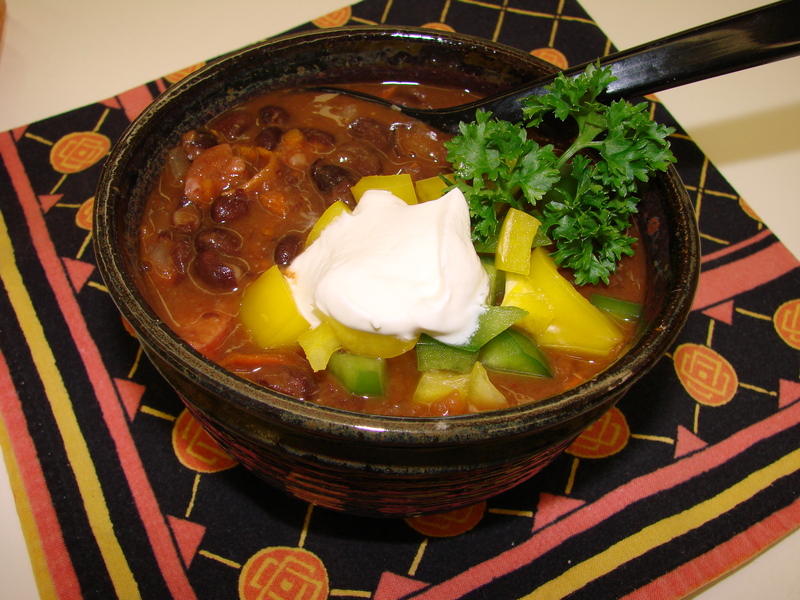 Mexican Bean Soup……..add Chorizo sausage and chili and cumin…….or add a packet of Taco or Chili mix into the soup…….and serve with sour cream and chopped Cilantro, grated cheese, and warm flour Tortillas. Italian Bean Soup………add 2 Tbsp of Tomato paste, Linguisa sausage and Balsamic Vinegar…….serve with pasta and Parmesan cheese. in whatever country you call home. I will answer any questions about this recipe……just leave me a comment…….and…… do let me know how you liked the soup after you made it…..mine is now cooking on the stove! Sure sounds good Maria! I can smell it from here. Looking forward to my own batch. Debbi…….let me know what all you put into your bean soup? Loved this post Maja! Inspired me to make a batch myself to warm us up! Betty Ann……..I just made some bean soup as well……and froze several portions…..for future……. either lunches of dinners. You just sent me to the kitchen to put on a pot of something or other with veggies and chicken and Israeli couscous and tomatoes and broth and bay leaf and thanks for the kick in the pants Maria. It is vegetarian for Gabrielle too. The usual chopped celery,onion,carrot, then potatoe, parsnip, canned whole tomatoe,black beans, mushrooms,bouquet garni, S & P, Wolfgang Puck Organic veggie broth, garlic powder (just a smidge), and inste…ad of Israeli Couscous, I added a handful of a mixed grain which has lentil, quinoa (red), garbanzo (tiny) and couscous. It should be delicious and perhaps a nice little touch of grated Asiago on top of each bowl with some buttermilk biscuits. She is working late as she has a student she will tutor after her internship job and then a long drive home in late rush hour traffic. This should be just fine. If not, we have sushi with extra pickled ginger instead. Hi Irene………bin froh dass es Dir besser geht……und dass Du meine Bohnensuppe bald ausprobieren wirst………. I wish I could have you all in my kitchen right now and share with you my Hungarian style bean soup………..
Poor people were just poor, not dumb. It was the rich people, with their penchant for richer foods, that were perhaps not so smart? Snowed in- a perfect day to experiment with flavors. Half white beans, half black beans plus “al fresco roasted pepper and asiago chicken sausage” in the crockpot. Can’t wait for supper! Jill………your combination with white and black beans and then the peppers will be really beautiful in your plate when supper happens tonight…….I can see it in my mind……. Hugs to you……..and do stay warm! Sounds delicious! I crave soup this time of year. I love your stories and recipes. I love to make soup this time of year and will be making Bean Soup soon. Love the lentil soup out there! came here from FB and loving the beautiful space. Following to be in touch and get more of such visual treats. I LOVE lentil soup as well…….but, being Austrian it is not surprising……..here in the US I find that Americans do not like lentil soups…………..or salads ……..or purees……. I’m quite the bean fan and use them often in my cooking. I love that they are both economical and nutritious. On Sunday I made a large pot ofvenison chili with kidney beans. I’ve heard some people say that beans don’t belong in chili but I add them in anyway. Thank you for your nice comment………loved it! 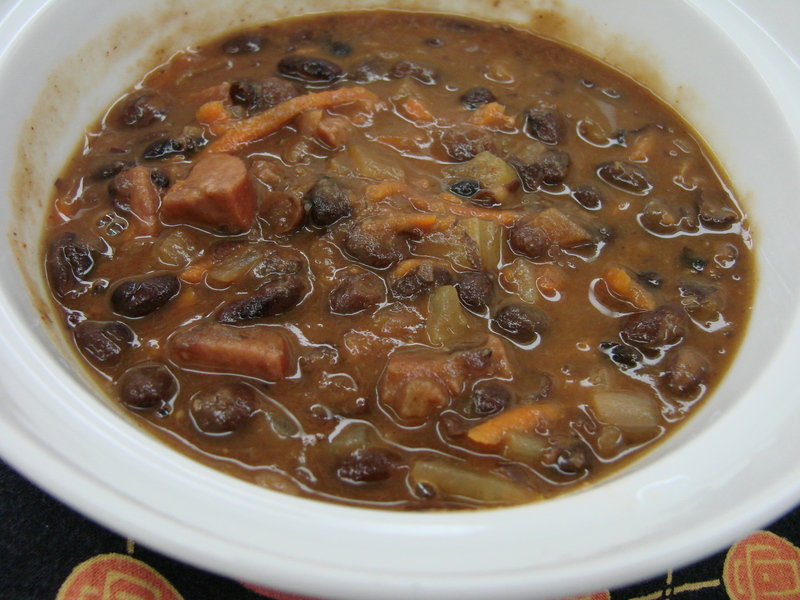 I love beans and make them often – your soup looks comforting…. Nina………….thank you for your comment………. I will add smoked bacon in my bean soup the next time and will call it Romanian………..do Romanians add sour cream as well? Romanians have two types of bean soup – the clear one, where the beans retain their shape and the one called “iahnie”, more of a stew I think, in which the beans are simmered for so long that they start losing their shape and integrity, creating a creamier, thicker type of soup. Sour cream is sometimes used for the clear one but only when served, as garnish. I stumbled upon your blog and have read every single post. My family has very similar stories about refugee camps and leaving everything behind for the North American life. My forefathers are from Croatia also – the Dalmatian coast. As a child growing up in snowy Canada I remember my mom making roman bean soup with smoked bacon, sweet Hungarian paprika and sauerkraut. It wasn’t a Dalmatian recipe per say, but rather from Slavonija (I think). She would then finish it off with a little drizzle of olive oil. We always ate it with caraway bread or leftover polenta that was shaped in a loaf pan and then sliced when cool. It was a one pot meal that was eaten during autumn and winter. I remember how woodsy the kitchen smelled from the aroma of bacon and sauerkraut. I can’t wait for your cookbook! My mom spent many Saturday afternoons baking and filling tortes for the weekly Sunday dinners when the Croatian priest would join us in breaking bread followed by playing chess and watching a TV program called the Ed Sullivan show. How I miss those wonderful family dinners that lasted for hours…. God bless you, and continued success in your publishing endeavors. Anna…………it was such a surprise and delight to find your comment this morning……..It is so wonderful to find a kindred heart with whom one can identify so well………. Yes….we spent many years in refugee camps in Austria……but, as a child I did not feel deprived in any way…..since I had wonderful mother and father who looked after me with great love. When we came to America we had to start from scratch and my mother cooked every day our own kind of food…because, as you know Croatian food is not expensive and is still the best I have ever tasted. As you read my heritage it is more Austrian while having been born in Croatia, I identify with both countries very strongly, and my best connection with both will be with the food that I cook or teach. Hugs to you my new friend………..
Well you have the best of both worlds. Lucky you. A Croatian soul and the palette and knowledge of an Austrian pastry chef – Austrian pastries and tortes are the best in the world, in my opinion. The Viennese coffee houses are exquisite. I wish I lived closer to you to attend one of your baking classes. Your wedding cakes are absolutely works of art. I’ve gained 10 pounds just looking at the photos you’ve taken. You are an artist with your hands and photographic eye.